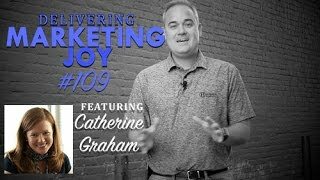 This week in Episode 109 of Delivering Marketing Joy! Kirby interviewed Catherine Graham CEO of commonsku. During the interview, Catherine discussed why she decided to create Skucon. Catherine moved from a company that provides services to a product business, which she named “commonsku.” She talked about how much one is different from the other. Ms. Graham listed the lessons learned from this experience. Many things are different in the product industry, including structure, function, marketing, and the overall business.Learning the different aspects of software development was by far the trickiest. Taking the time to understand the complexity of the programs was a vital step to the transition. This preparation allowed Catherine to discover a strong connection between knowledge and success. This was the foundation to the new idea of Skucon. Skucon is commonsku’s must-attend user seminar for the promotional products industry. This seminar is full of professionals that are eager to share their hard-earned knowledge of the promotional products industry. This conference is all about education and helping others grow in their business endeavors. It is centered around entropenors and strives to be one of the best places to get current content. Catherine believes that seeing commonsku’s customers face to face is a great way to bring the community together. This resource provides a different communication style than skype. This allows them the opportunity to share their wisdom and continually getting feedback from consumers to help grow commonsku. Want to keep up all the time? Make sure to join our VIP List! Our VIP’s get an email with the latest content…and other special offers as well. Join here.